In 1985 Philip Blackburn climbed the stairs to an attic in Iowa City and started trying to make sense of the boxes piled up there. They contained a composer's life's work: scrapbooks, tapes, photos, letters, scores, and film reels - fragile treasures documenting the Twentieth Century from a most unusual viewpoint; perhaps the world's most original musician: Harry Partch. The idea was to publish them and reveal Harry to the world on his own terms. Not as the crabby, homeless, self-taught microtonal musical weirdo and instrument maker, but as that most American of all artists; a truly independent thinker. With Enclosure 8, the work of bringing them to public attention reaches its apotheosis. The Enclosures series (named for the extras Partch wanted to add to his life-long letter to the world) started appearing in 1995 with a VHS video of four films made in collaboration with the Chicago-based film-maker Madeline Tourtelot. Four CDs, two years and one book later, Enclosure 4 appeared featuring his later films: Delusion of the Fury (his culminating ritual-theater work) and a San Diego Public TV documentary, also on VHS. Now the time has come for these to be issued on DVD, extensively restored, resynched and digitally remastered from the extant original prints. Until books and CDs become as obsolete as VHS, the Enclosures series is complete and, taken together with the Harry Partch Collection on New World Records, Partch's entire work is available for the first time. Innova's DVD, Enclosure 8, offers not only a chance to see higher quality versions of previously-available material, but it also includes two performances made after Partch's death in 1974: a 1981 staged production of his hitch-hiker piece, Barstow, directed by Danlee Mitchell; and a 2006 choreographed version of Castor & Pollux, performed by John Schneider's ensemble Partch using replicas of Partch's original set of instruments. * Music Studio: Harry Partch (1958): Partch takes the viewer on a tour of his Chicago home, and plays his microtonal instruments. Includes his demonstration of how the soundtrack for Windsong was made. * Windsong (1958): the ancient Greek legend of Daphne and Apollo, transported to Lake Michigan. * U.S. Highball (1958; completed 1968): Partch and his ensemble perform a dramatized account of riding the rails during the Depression on a transcontinental hobo trip from California to Chicago. * Rotate the Body in All Its Planes (1961): Harry's favorite: a ballet for gymnasts. The DVD is accompanied by a 12-page booklet featuring writings by Philip Blackburn, Danlee Mitchell, and Harry Partch. 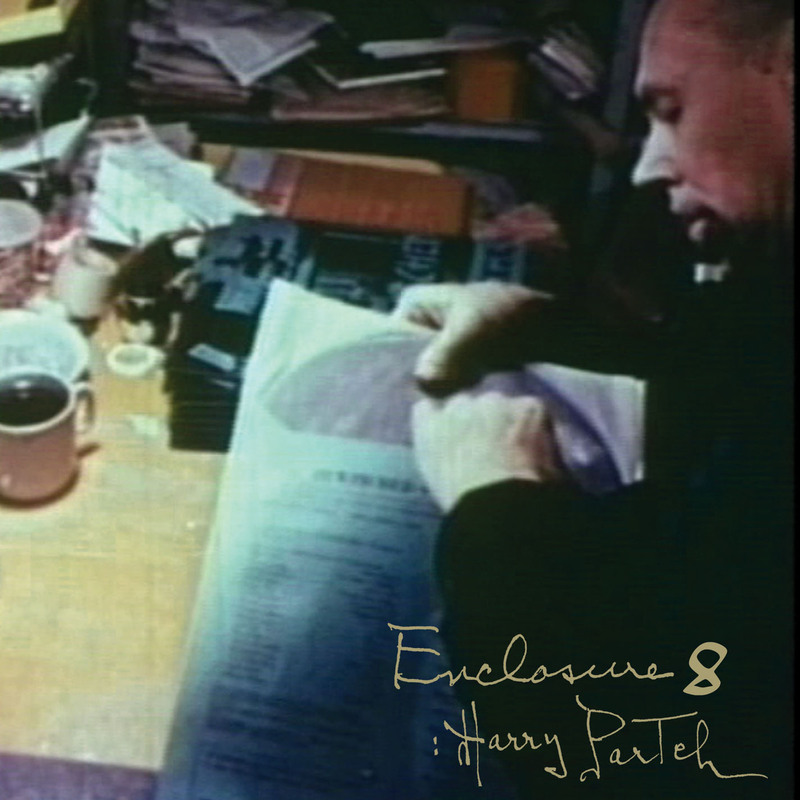 Fortunately, there are now better resources for learning about Harry Partch; and one of the best of them is a DVD, which I recently purchased from Downtown Music Group, entitled Enclosure 8: Harry Partch. The "Enclosures" are a collection of archival materials of text, audio, and video; and much of the material on this disc had been previously released on two VHS "Enclosures" (the first and fourth). Thus, all of the old video material is now on DVD, along with two new items, both of which are of performances that postdate Partch's death in 1974: a 1981 concert performance of "Barstow" and a 2006 choreographed performance of "Castor and Pollux" (both compositions included on the old Columbia recording). The best part of Enclosure 8, though, is the material that had previously constituted Enclosure 1, four films by Madeline Tourtelot, the first of which, "Music Studio," is about Partch and the many instruments he invented for the performance of his music. This is, without a doubt, the best way to begin the process of getting to know Partch, his theory of dividing the octave into 43 parts, the sounds of the instruments (and the pitches of his tuning system), and all the physical issues intimately connected with performing on those instruments. Tourtelot's films are also not particularly polished, which may be one reason that I no longer have a taste for the Columbia approach to Partch's music. Nevertheless, they provide an expository account of Partch the composer and the inventor that treats the subject with a sympathetic respect that has become rare in more recent expository film. Much of the music that Partch uses to demonstrate his instruments comes from the soundtrack he composed for another Tourtelot film, "Windsong," which, conveniently enough, is the next selection on the DVD. Thus, in these two juxtaposed films, we learn about Partch in both theory and practice. The music was also turned into a suite independent of the film, which is performed as part of the KEBS-TV documentary, "The Music of Harry Partch;" so the DVD actually provides three perspectives on this one piece of music. The real fun begins, however, with "U. S. Highball," which, along with "Barstow," is a "hobo" composition. The film alternates between the ensemble performing the composition and footage of the sorts of freight trains and railroad yards around which hobo life and transportation were based. I have now seen this film several times and have no qualms about saying how exhilarating I find each viewing. It's some of the best introductory material... Anyone interested in the American avant-garde will appreciate this.